We were out sailing the Bay on Sunday and noticed a guy in a small inflatable trying to row across the Golden Gate. Rowing an inflatable is hard enough, let alone against a strong ebb while having to dodge countless sailboats, tour boats, and large ships. We don't recommend it. Apparently the Coast Guard didn't think much of it either, as they showed up before long to remove him from what was a clear danger zone. Also while sailing the Bay on Sunday, we crossed paths with Feet, Bill Anderson's self-built, just-launched Hughes 36 catamaran design that he stretched to 39 feet. 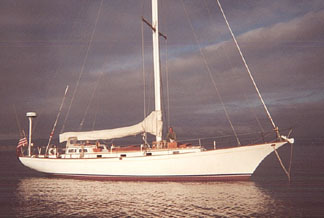 Anderson, who owned a series of monohulls including an Endurance 38, was a snowmaker at Squaw Valley suffering from back problems when he decided to start the boat in January of '95. He subsequently put in 9,000 hours - "a tenth of my life" - and $120,000 to complete what you see in the photos. The boat was built using the cylinder mold method - which Anderson found "a little imprecise" - involving three layers of 1/8 doorskins saturated in epoxy. The resulting structure is a light 6,500 pounds, which is not only very fast, but also very responsive. "With a quick turn of the helm, I can throw anybody off their feet." His best speed on the light air day was a sizzling 15 knots. Anderson's goal is to sail to the Caribbean the winter after this and do six-pack charters. When Anderson launched Feet, he kept her at Harris Marina in Pittsburg. Alas, a month ago PG&E kicked the marina out. St. Francis YC's 23rd annual International Masters Regatta, held on Oct. 12-14, was lower-key, warmer and fuzzier than last year's epic gathering - but nonetheless still excellent. 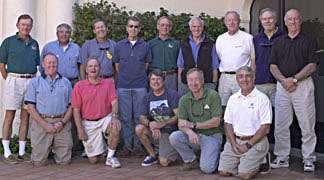 Fourteen skippers, all at least 60 years old, were invited to the five-race, round-robin J/105 series - six were local, two from SoCal, one from Seattle, and five from east of the Mississippi. Crews had to be at least 45 and, as opposed to last year, rockstars (Category 3) were banned. The competition was fierce, the Indian summer weather perfect, the camaraderie excellent. With two different race venues (Cityfront for the first two days, Berkeley Circle for the last) and different borrowed boats each day, the regatta was quite challenging. The eventual winner, Florida chiropractor John Jennings, had another obstacle to overcome - he only brought along one crew, restaurateur Phil Smithies, and had to draft local sailors he had never met before to round out his squad. Obviously a quick thinker and a gifted sailor, Jennings patiently solved the riddle of this year's Masters, putting together a fine 3,4,7,2,4 series to beat local sailor John Scarborough and his 'Frick n' Frack' crew by one point. Kudos to organizer Don Trask, race chairman Pax Davis, race manager John Craig, sponsor Dry Creek Vineyard, and - above all - the J/105 owners who generously loaned their boats for this wonderful event. Complete results and crew lists can be found at www.stfyc.com. BOATS USED (alphabetical order) - Aquavit, Arbitrage, Blackhawk, Capricorn, Hazardous Waste, Horseplay, Irrational Again, Kookaburra, Larrikin, Liberty, Nirvana, Tiburon, Whisper, #443. Could that be. . . Kimball Livingston on the bow? An upwind leg. . .
. . .a downwind parade along the Cityfront. . .
. . .and a patriotic parade in front of the St. Francis. Now that the Volvo Fleet has reached the tricky part of the 7,500 mile first leg from England to Cape Town, Grant Dalton and Amer Sports One have slipped in front of John Kostecki and illbruck. But the lead is only about two miles and there are still more than 2,000 to go. "I took this photograph of Warren Sankey's Rhodes-designed Rowena a couple of weekends ago at Drake's Bay during the Master Mariners' oyster feed," writes Tom Jackson. "Warren and I had sailed Rowena up that afternoon. I was the previous owner of Rowena, and a full decade has gone by since I sold her to Warren. I owned her for four years after Barre Stephens passed away, and had also sailed her for years with Barre before buying her. Although I have owned Lester Stone's personal boat Scamp for the last five years, Rowena is the finest sea-going sailboat on the West Coast. Furthermore, she's in better condition than ever - including the day she was launched." We hung out with Barre and Rowena a couple of times, both in Cabo and in San Francisco Bay. Both he and the boat were a couple of class acts. No Beautiful People at Catalina? "I didn't know she was famous, but she stood out because you don't see beautiful people like that in Catalina." So says Dawn Smith of Santa Rosa, who as a nine-year-old had her hair brushed by actress Natalie Wood in a Catalina restaurant just hours before Wood drowned. This important news was revealed during a radio talk show about the new biography called Natasha. Looking for current as well as recent wind and sea readings from 17 buoys and stations between Pt. Arena and the Mexican border? Here's the place - which has further links to weather buoys and stations all over the U.S.: www.ndbc.noaa.gov/stuff/southwest/swstmap.shtml. The University of Hawaii Dept. of Meteorology page posts a daily map of the NE Pacific Ocean barometric pressure and winds. Check out the Pacific Ocean sea states at: http://www.mpc.ncep.noaa.gov/RSSA/PacRegSSA.html. For another view, see http://www.oceanweather.com/data/global.html. 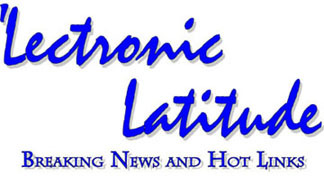 ©2001 Latitude 38 Publishing Co., Inc.